A compassionate society, by definition, is one where all its citizens feel happy to live their lives and bring up their children in an atmosphere of mutual respect and tolerance; one in which citizens hold common democratic values which encourage individuals to practice their own faiths, and retain their own cultural and historical heritage whilst at the same time subscribing to a shared sense of being British. 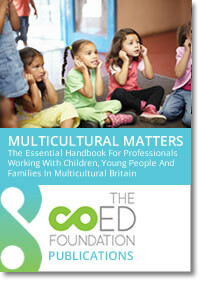 Multicultural Matters will be an electronic which book has been over 35 years in the making. Originally conceived in 1976 as The Essential Handbook for Schools in our Multicultural Society by Maurice Irfan Coles, sections have been written over time and have appeared in various journals. We are not starting from scratch, nor are we working alone. The overall aim is to edit much of our earlier work, to approach individuals for permission to use some of their articles, and to commission a number of friends to write various sections. Our target audience is in the first instance, those in education but it is wider than merely education, as much of the work overlaps into the Social and Health Services and we would look to exploring these links proactively. Essentially, the book aims to provide a one stop shop for the theoretical, practical and knowledge requirements of all those who strive to bring compassion, social justice, and equality into our multicultural interdependent world.